Sergio Martino, to me, is the king of Giallo. 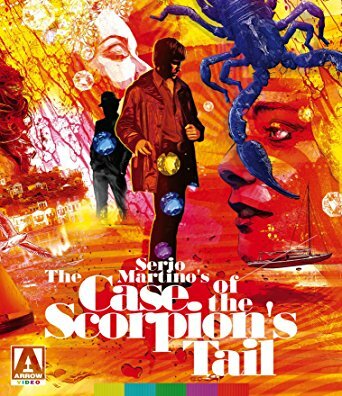 I know Mario Bava is credited with starting the genre with The Girl Who Knew Too Much in 1963 and Dario Argento popularized it with The Bird with the Crystal Plumage in 1970, but pound for pound, I will take Martino. From 1971 to 1975, he directed six of the greatest Gialli ever made and like many of his contemporaries, dabbled in other genres as well (Spaghetti Western, Poliziotteschi, Sci-Fi, Horror, Action/Adventure). I first discovered Martino many years ago when I stumbled across one of his Giallo masterpieces, Torso (1973). From there, I watched Mountain of the Cannibal God, Island of the Fishmen and anything else I could get my hands on. At the time, Case of the Scorpion's Tail was hard to find so I had to track down an overpriced copy of the out of print NoShame DVD. It was well worth it. The Case of the Scorpion's Tail starts out with Evelyn Stewart (aka Ida Galli) as Lisa, who learns that she is receiving a million dollar insurance pay out after the death of her much older husband. George Hilton plays Peter Lynch, an insurance investigator sent to make sure that the death was not suspicious. Peter realizes something is askew when a murder attempt is made on Lisa's life by her husband's lover (Janine Reynaud) and he must do whatever he can to protect her. A police inspector (Luigi Pistilli) and an interpol agent (Alberto de Mendoza) also get involved to ensure Lisa is kept safe and to determine if Peter is telling the truth about his interest in the case. After bodies start piling up, a reporter (Anita Strindberg) also tries to uncover the case and becomes Peter's lover. La coda dello scorpione (translated to English as The Tail of the Scorpion) is simply one of the greatest Giallo ever made. To think Martino made this film and the equally classic The Strange Vice of Mrs. Wardh in the same year is mind blowing. It has all of the identifying characteristics of the genre and a plot so twisty, that you never know what is about to happen. Writer Ernesto Gastaldi, who has written many of the best Giallo films, uses the plot of murder for inheritance (made popular, as I learned in the bonus features, by Clouzot's Les Diaboliques) to create a hypnotic tale of intrigue. George Hilton does a great job as the hero and Anita Strindberg as well as his love interest. All of the supporting characters are well developed and quirky, which adds to the mystery within the film. Not only does the film have strong characterization and an engrossing story, but Martino's use of visuals, whether they be the breathtaking Greek scenery or a smashed bottle to the eyeball, are startlingly artistic and well crafted. Beyond the film itself, Arrow's new Blu Ray contains several bonus features that make this a must have purchase. There are interviews with George Hilton and Sergio Martino as well as two critical features on the film.